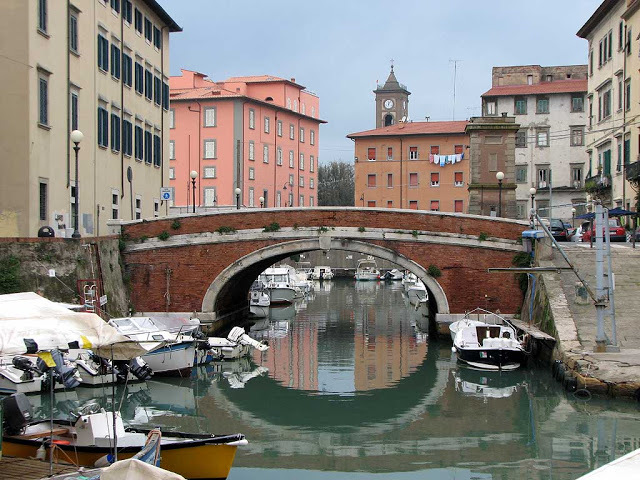 Just outside of the center of Livorno, Tuscany’s most important port, is “Little Venice.” Hosted by a neighborhood that’s certainly not sinking unlike its northern Italian counterpart, Effetto Venezia returns to Livorno’s La Venezia the first week of August. From August 1 – 5, the festival will embrace the city streets for the 33rd consecutive summer, presenting a multitude of free shows, concerts, and events from 7 pm onward. Don’t let the name mislead you; unlike the Las Vegas plastic reinterpretation, Quartiere La Venezia is an authentic gateway to Livorno at it was centuries ago, when it was one of the busiest ports in the Mediterranean. In the 17th century, Medici Grand Dukes funded the building of canals connecting aristocratic residences to warehouses and shipping routes. This facilitated a trade boom in the city that brought in a huge influx of wealth. Starting at Livorno’s city hall and continuing onto Via Porticciolo before turning right onto Via Borra, visitors can witness the former neighborhood of the city’s important merchant families of the 17th and 18th centuries. Decadent palazzos are visible from the street, just steps away from the narrow waterways that used to carry goods from around the world. The Ponte di Marmo is at the beginning of Via Borra, and the romantic inscriptions Livornese canal-goers left for their deceased loved ones are still present on the bridge’s marble railings. Further along the street is Palazzo Huigens where Cosimo III and many other European nobles stayed when visiting Livorno, the marble façade of the Palazzo delle Colonne, and then Piazza dei Domenicani, where the church of Santa Caterina — an octagonal-towered church home to a restored altarpiece by Giorgio Vasari — is located. More unorthodox monuments to Livorno’s political importance and entanglements lie in this area as well—with a former San Domenico convent turned prison (where anti-fascist activists Ilio Barontini and Sandro Pertini were imprisoned) and the remains of the Teatro San Marco, the site of the formation of the Italian Communist Party in the 1920s, later heavily bombed during WWII. Views of the Fortezza Nuova, the 17th century fortress that looks out over the canal’s blue-green waters, can be caught from the Piazza dei Domenicani as well. Offering free admission, the anticipated yearly festival is characterized by this year’s theme: “Talent in Art, Culture, and Sport.” Under this umbrella topic, the week will honor Livorno’s sporting history, paying particular attention to the city’s past Olympians who have distinguished themselves in their respective fields. In conjunction with the municipal museum, the festival will additionally display memorabilia of the region’s athletic legends. Visitors can view the traveling exhibition of the FIGC Soccer Museum and the Federal Technical Center of Coverciano. The festival likewise features special interviews with the athletes, as well as sporting exhibitions and conversations with sports journalists. Beyond the scope of this theme, Effetto Venezia includes nearly a full week of shows and entertainment, bringing music, street art, comedy, and theater to the district. Each evening is jam-packed with options for performances, from acoustic set-lists to conversations with artists to photography exhibitions. Guided tours, as well as boat trips along Livorno’s canals, offer guests the opportunity to engage with both the week’s acts and the place that hosts them. These itineraries include street art and focus on the city’s hidden works. Blub’s underwater portraits are among the notable pieces. Not just limited to the streets of Livorno, Blub has made a name from himself throughout Italy with sporadically placed, scuba-masked characters scattered throughout the likes of Florence and Pisa. Beyond Blub, Effetto Venezia street art includes works from Clet, Exit Enter, and Uovo alla Pop. To accommodate the plethora of activities, the festival will set up multiple stages; as usual, Piazza del Luogo Pio will feature prominent musicians, while additional spaces Galleria della Cannoniera and Falsabraga della Nuova will likewise host events. Opening the festival, artists Carmen, Chiara Galiazzo, Emma Muscat, Federica Carta, and Lele will perform, among others, as part of Radio Stop Festival’s evening kick-off on August 1 beginning at 10:30 pm. Zen Circus will take to Piazza del Luogo Pio on August 2, bringing a grunge-rock set list sure to satisfy even the moodiest of audience members. In addition to the band, Maremma i Matti delle Giuncaie will bring the group’s folk sound to the stage on August 3, while Livorno Stardust takes the stage on August 5 with a tribute to David Bowie. Bobo Rondelli, the Honolulu Symphonic Snaporaz, and BFolks will also be featured on the festival’s closing night. A particularly noteworthy headliner is a band who first rose to fame with a second-place finish in 2018’s Sanremo Festival. Two days after Zen Circus, Lo Stato Sociale will deliver a fun-filled performance on August 4 at 10:30 pm in the same location. With infectiously happy hits like “Facile” and the satirically delightful chart-topper “Una Vita in Vacanza,” Lo Stato Sociale will bring audiences to their feet for the entirety of the two-hour performance. The band’s goofy spirit coupled with their upbeat melodies make for a light-hearted show perfect for the streets and waterways of Livorno. For those looking for a more mellow concert scene, classical musical concerts will fill the Palazzo Huigens. At 9:30 pm, the 18th century venue will host nightly performances, including that of acclaimed pianist Gabriele Baldocci on August 3. Relax with classical music and conserve your energy for the evenings’ outdoor discos in Piazza dei Domenicani. With a lineup of different DJs each night, the dance backdrops are guaranteed to light up the piazza — thanks to both the melodies and open-air starlight. In addition to entertainment, Effetto Venezia boasts a new recycling program with 60 collection points and 200 containers throughout the district. Dividing waste into paper, plastic, and organic matter, the festival is especially green-centric, proving that fun and the environment are not mutually exclusive. This year’s festival plans to use biodegradable material only. Open to more than one age-demographic, the event also appeals to the younger set with children’s shows beginning August 1. Starting with a comic show at 9 pm, the children’s area guarantees Effetto Venezia is fun for the whole family and provides entertainment for the tiniest of travelers interspersed throughout the actual events.